Abstract: Studying complex systems became a very rich field of research for last one decade and subjects like sociophysics and econophysics have emerged. In this talk I shall mostly discuss different models for the opinion formation in a society. Some of this models also surprised people with proper predictions on socio-politocal events. At the end I shall present my own work in this field. Network communication: How best to spread the message? Technology, Time and Trust: Incipient Economics? Thirty one selected papers will be presented by Faculty and Research Scholars from University of Melbourne, ISI Delhi, Delhi School of Economics, JNU, Shiv Nadar University, Jadavpur University, Calcutta University etc. Other Speakers : Soni Sori, Shandra Woworuntu (USA) , Fatima Khatoon, Mumtaj Begum, John Dayal, Dr. Asha Hans, Kumar Rana, Miguel Das Queah, Dr. Samita Sen, Malini Bhattacharya, Dr. Maroona Murmu, Prof. Sakina Shahin, Manisha Banerjee, Dr. Asha Mukherjee, Dr. Nandini Ghosh, Shampa Sengupta, Dr. Satyajit Dasgupta, Rajib Halder, Adv. Salma Ali (Bangladesh), Maleka Begum (Bangladesh), Ruchira Gupta etc. The Department of Geography, Presidency University, Kolkata is organising a Three Weeks Workshop on Geographical Methods from 4th December, 2017 till 22nd December, 2017. A total of thirty seats are on offer at the Workshop. A number of reputed resource persons from institutions within Kolkata and across India shall be on hand to instruct on the tripartite themes. Only the selected Participants shall be required to submit a Demand Draft of amount Rs. 3,000/- drawn in favour of "Presidency University" and payable at Kolkata. on the day of commencement of the Workshop at the Department of Geography, Presidency University, Kolkata. Date: 16th November, 2017, Thursday at 2-30 p.m.
Abstract: Quantum mechanics is a cornerstone of modern physics. Just as the 19th century was called the Machine Age and the 20th century the Information Age, the 21st century promises to go down in history as the Quantum Age. In this talk, I will discuss key properties of quantum systems called Quantum Superposition and Quantum Entanglement. I will discuss the world of single and entangled photons and also discuss ongoing work towards quantum technology in our Quantum Information and Computing lab at the Raman Research Institute, Bengaluru. Abstract: The universe is magnetized on all scales probed so far, from planets and stars to micro Gauss strength large scale fields in galaxies and galaxy clusters. Recent observational evidence suggests that even the intergalactic medium in voids could host a weak femto Gauss magnetic field, coherent on Mega parsec scales. How did the Universe get magnetized? We discuss how the first seed magnetic fields could arise in the early Universe or in astrophysical batteries. These need to be amplified and maintained by cosmic dynamos in collapsed objects, which convert the kinetic energy of motions to magnetic energy. The basic idea behind such dynamos and the challenges they encounter are described. It is relatively easy for magnetic energy to grow, but explaining the spatio-temporal coherence of cosmic magnetic fields remains challenging. Title: How much can one "see" with a single quantum of light at the Large Hadron Collider? Title: Do the Fundamental Constants change with time ? Abstract: Temporal evolution in low-energy fundamental constants such as the fine structure constant and the proton-electron mass ratio is a generic prediction of field theories that attempt to unify the Standard Model of particle physics and general relativity. The exciting possibility of low-energy tests of such unification theories has inspired a number of methods to probe fundamental constant evolution on a range of timescales, from years to billions of years. Astrophysical studies of redshifted spectral lines provide a powerful probe of such putative changes in the low-energy fundamental constants across a large fraction of the age of the Universe. After reviewing the current state of the field, I will focus on two techniques, based on radio spectral lines from the hydroxyl and methanol molecules, and will describe new, high-sensitivity results from these methods. Finally, I will discuss present limitations of such studies and the improvements that are likely to be possible with the advent of new experimental and observational facilities over the next decade. Abstract: Spintronics and Magnonics are rapidly emerging fields with huge potential applications in magnetic storage, memory, logic, microwave source and data communication devices, and for them to become viable and sustainable technology it is imperative to study excitation, manipulation and detection of spin dynamics in artificially structured materials. Here, we present three different methods of excitation and detection of spin dynamics in ferromagnetic thin films, multilayers, heterostructures and two-dimensional arrays of nanostructures. Optical, thermal and electrical excitation and detection of spin waves in artificial two-dimensional, pseudo-one-dimensional and quasi-periodic ferromagnetic nanodot, nanostripe and nanoantidot lattices will be presented by time-resolved MOKE microscope1, Brillouin light scattering and ferromagnetic resonance spectroscopy. Investigation and control of collective spin-wave spectrum and Gilbert damping behaviour by varying the physical and material parameters of the magnonic crystals and bias magnetic field will be discussed.2-7 New observations such as magnonic-mode splitting2, bandgap formation5,6, tunability of bandgap5, dynamic dephasing2, tunability of inter-element interaction3,4,7 and transition from collective to non-collective dynamics2 will be discussed based upon experimental data and numerical simulations. Further, spin-Hall effect generated spin torque and Rashba spin-orbit torque induced excitation of ferromagnetic resonance, modulation of damping and its optical detection has been employed for the first time in ferromagnetic/nonmagnetic bilayer thin films and spin-Hall angle of heavy metal layers have been estimated8,9. Finally, detection of pure interfacial Dzyaloshinskii-Moriya interaction by Brillouin light scattering measurement of thermal spin waves will be presented10. Acknowledgement: The author gratefully acknowledges financial assistance from Department of Science and Technology, Department of Information Technology and S. N. Bose National Centre for Basic Sciences. Economics Department is organizing a three-day workshop on ‘Big data and Nonparametric Econometrics’ during 13, 14 & 16 October 2017. 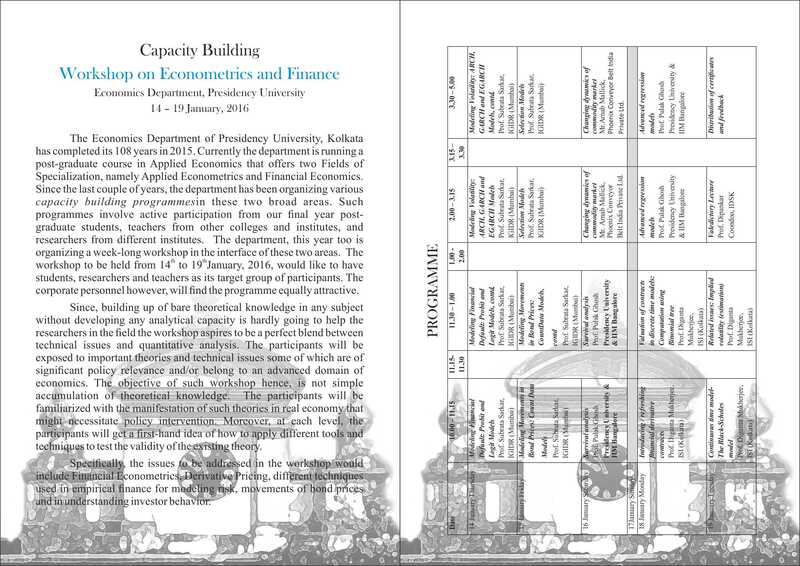 Kindly see the attached programme of the Workshop. More..
Abstract : At present modern cosmology is soundly based on precision data obtained by several state-of-the-art observations, like WMAP and PLANCK. Physics spanning over a length scale of almost 61 orders of magnitude, starting from the Planck length to cosmological scales of thousand of mega parsecs, can be probed via cosmological observations. On the other hand, Quantum Mechanics is one of the most successful theory we have today and our modern world carries the signature of its success. Even though the elusive dynamics of quantum mechanics often evokes question about its fundamental nature. In laboratory systems, such problems are known as the Measurement problem of Quantum Mechanics. We will argue in this talk that such fundamental problems of quantum mechanics, seen in a cosmological background, become more serious as the Copenhagen Interpretation breaks down in a cosmological setup. We will then try to see whether any modification to standard quantum dynamics, in order to take into account the measurement problem, can play any significant role in Cosmology and whether we can put such theories to test by looking at cosmological observations like Cosmic Microwave Background. Seminar at the Department of Mathematics, Presidency University. Formerly Professor of eminence at TIFR in Homi Bhabha Chair. Title: Fermat's Last Theorem - a mathematical treasure hunt! Abstract: The historical development in modern Mathematics with this celebrated result will be discussed in this lecture, which took more than 350 years for finding a proof. All students are informed that an Academic Writing Workshop, focusing on Term Paper writing will be organized at 3.30 pm on Wednesday, 13th September 2017. A high speed jet of water impinging on a flat surface flows out radially (as happens in a kitchen sink although boundaries do interfere) and in some cases show a virtually discontinuous jump at some radius. The jump occurs at the radius at which the incoming disturbances (ripples) are blocked by the high speed flow and creates an analogy with astrophysical objects. we will discuss different aspects of this jump and the analogy. A departmental seminar will be held on 13/09/2017 at 02:30 pm in the department of Bengali. A departmental seminar will be held on 06/09/2017 at 02:30 pm in the department of Bengali. Abstract: The concept of Self-organized criticality (SOC) will be discussed after mentioning two models exhibiting continuous phase transitions. The idea of Bak et al for introducting SOC will be explained. The sandpile model will be defined, explained and difficulties with this model will be discussed. Few experimental set up and results will be discussed. Finally if time permits recent works in the field of SOC will be included. A departmental seminar will be held on 30/08/2017 at 03:00 pm in the department of Bengali. Abstract: Why do we live in four dimensions? Why is gravity weaker than the other forces observed in nature? What drives the expansion of the universe? What is dark­matter? Why are the masses of neutrinos so small? Why is the mass of Higgs boson so much small compared to the Planck mass? Is there a connection between these apparently uncorrelated physics at completely different length scales? This talk will survey these mysteries of the universe in the backdrop of extra­dimensional models and brane­worlds. The stability of the brane­world model thus becomes a crucial issue to be addressed. After reviewing some of the popular extra­dimensional models, I will focus on the widely popular warped brane­world model with non­flat branes and discuss how it can be naturally stabilized by the brane vacuum energy. Our proposal brings out the remarkable feature that the braneworld modulus can be stabilized without introducing any ad­hoc external stabilizing field. Professor Ashok Banerjee, Professor of Finance, Indian Institute of Management Calcutta, will deliver a special lecture on GST: Is it so Good and Simple? on 28 August 2017 in Economics Seminar Room from 3.30 to 5 pm. The Goods and Services Tax (GST) replaces a plethora of indirect taxes. Will GST, thus, reduce the burden on ultimate consumers? GST is a destination based tax. Thus, if a company in Kolkata sells products or renders services to a firm in Gurgaon, the state GST would accrue to Haryana and not to West Bengal. Will producer states lose revenue? The notion of one nation one tax sounds good- but is it simple? These questions will be discussed in the talk. Abstract: Remote Sensing is a wide interdisciplinary field comprising various disciplines of physical science, earth science and engineering. The physical principle of remote sensing is to detect the interaction of electromagnetic radiation, mainly solar radiation with terrestrial objects and atmospheric constituents from far distance, such as airborne or satellite-based detectors. The procured data are often recorded in the form of images and analyzing the images, various information can be obtained on natural resources, environment and human activity. This presentation explains the imaging techniques, related physical laws and instrumentation. The principal techniques of image processing are introduced. Several recent trends in modern remote sensing and the scopes for a student of physics are highlighted. Some personal research experiences are shared. Dr Nayanika Mookherjee, Associate Professor (Reader) in Socio-Cultural Anthropology, Durham University, UK, Author of The Spectral Wound. Sexual Violence, Public Memories and the Bangladesh War of 1971, will deliver a lecture on 9th August, Wednesday,2017 at 2.00 pm in the department of Sociology, Seminar room. Debopam Bhattacharya of Cambridge University will give a talk on Endogeneity in linear and limited dependent variable models on 11th August 2017 from 3 to 5 pm in Economics Seminar Room located at Economics Department, Presidency University. Title: "Where Particle Physics meets Cosmology: The case of the missing antimatter"
The universe very definitely shows an excess of matter over antimatter, which has been confirmed by several independent experiments. The universe started in a symmetric phase, with only photons in it. What caused the asymmetry between matter and antimatter? The talk will try to tell you the story of this quest, and will be at a pedagogic level, shunning any detailed mathematics. The story, however, is open-ended. Abstract: Our conventional wisdom that the objects and structures all around us are 3-dimensional was in for a pleasant surprise with the discovery of single (or few) atomic layer thin graphene, realized by simple exfoliation (mechanical or chemical) technique. This ultrathin wonder material of 21st Century boasts of several superlative physical and chemical properties that are now well established in the scientific world. This inspired an avalanche of research in the post-graphene ear, giving rise to a whole new world of 2D materials involving assortment of elements all across the periodic table, as well as their heterojunctions. In this talk I shall give a glimpse of this emerging field and the advent of a new platform to realize quantum engineered materials for innovative devices and novel applications. "Fundamental Theorems of Positive and Normative Economics"
during 21st to 25th August 2017.
WHO IS (NOT) A SERVANT, ANYWAY? Thinking of domestic servants requires us to ask two fundamental questions: who were they and what did domestic service mean? The identity of a servant as a contract wage earner as well as one of either a family member, or tied in some fictive/constructed claims of kinship was not exclusive to each other. The paper will address the question of servant relationship along two axes: one, that existed within the households along the continuum of slave-servant, and the other that was part of the eighteenth century colonial Calcutta labouring pool, coolie-servant. The invisibility and ubiquity of domestic servants stretching from households to public places require mapping the relationship at different social and spatial registers. The paper will discuss legal regulations related to work and wage to suggest that the specificity of ‘domestic servant’ was getting constituted through these regulations. Abstract: Mass is one of the basic properties of an object which we learn about early. Do we know what is the origin of mass? Obviously the mass of any object is determined by the masses of its constituents. But what of the masses of the most basic entities which are structureless? The accepted answer to this question has been experimentally verified only in this decade. And still there remain several open frontiers. In this talk, aimed at non-experts, we consider several of these issues, bringing to the fore the pivotal role played by symmetries. Dr. Sourav Bhattacharya, Reader, Royal Holloway University, London, will deliver a series of special lectures during July - September 2017 in Economics Department of Presidency University. The schedule is attached. All interested faculty and students are welcome. Abstract: Turbulence is often called the last unsolved problem of classical physics. But engineers, physicists, and mathematicians differ about that they would describe as the "problem" of turbulence let alone what its solution could be. I shall describe, in brief, the classical results of the theory of turbulence, its limitations and also the modern perspective. Presidency University invites applications for its first DANCE LAB to be held between 31st July to 5th September 2017. Guru Imocha Singh will teach the basics of Thang ta and Guru Navtej Johar will explore how the dancer’s body evolves as a result of practicing the classical and contemporary styles of dance. This program is open to all dancers. Abstract: It has been recently observed that certain novel phases of matter, like superconductivity, emerge at mesoscopic interfaces between elemental metals and topologically nontrivial systems like topological insulators and topological Dirac and Weyl semimetals. In this talk, I will review some of the published results on such mesoscopic superconducting phases with special emphasis on tip-induced superconductivity (TISC). A TISC phase is known to emerge under the point of contact between a sharp tip of a (non-superconducting) normal metal and a material with topologically non-trivial band structures. Since the superconducting volume fraction in a TISC is extremely small, traditional bulk characterization tools like regular transport and magnetization measurements fail to detect such a phase. I will highlight how probing Andreev reflection, a quantum process through which a normal current is converted into a supercurrent at such mesoscopic point contacts, can be useful in detecting TISC and understanding the nature of TISC. Title: Introduction to strong interactions. Abstract : In this talk we will take a preliminary look at Quantum Chromodynamics, the candidate theory for strong interactions and discuss its formulation, successes and what remains to be done for it to be recognized as the theory of strong interactions. Abstract: I briefly discuss recent developments in the physics of ultracold quantum gases. By loading the ultracold atoms into an optical lattice have opened up new possibilities to study strongly correlated many-body physics and non-equilibrium phenomena. Finally I discuss Superfluid to Mott insulator transition and non-equilibrium dynamics of dissipative Rydberg atoms in an optical lattice. as part of the Bicentenary celebration of Presidency. All are cordially welcome. Title: How to trap solar energy ? Abstract: One of the major challenges in the 21st century is to meet the ever-growing energy demands of the world in a sustainable and environment friendly manner. Solar energy is the most reliable renewable resource on the planet that can be the ideal alternative to the conventional energy sources. In fact, a very small fraction of the energy that reaches the earth's surface is sufficient to meet the global energy needs. How to capture, convert and store this tremendous natural resource? Solar cells or photovoltaic cells are the devices that convert the sunlight into electricity. Several disadvantages of crystalline Si wafer based devices that rule the present solar cell market, has led a tremendous research efforts in the last few decades to fabricate highly efficient solar cells with a modest cost. Thin film solar cells have been most promising till date in terms of efficiency. In this talk we are going to discuss the working principle of thin film solar cells, the problems with the thin film solar cells and the idea of using nanomaterials to increase the power conversion efficiency. Also there will be a brief overview on the present status of other ideas of trapping solar light like excitonic solar cells, plasmonic solar cells, quantum dot solar cells etc. Title: What is many body localization ? Abstract: It is well known that in a non-interacting disordered system, any small amount of disorder is sufficient to localize all the single particle states in one and two dimensions, while in three dimensions there occurs a single particle mobility edge leading to a metal-Anderson Insulator transition as a function of the disorder strength. The question of immense interest, that has remained unanswered for decades, is what happens to Anderson localization when both disorder and interactions are present in a system. Recently Basko e. al. based on perturbative treatment of interactions have established that Anderson localization can survive interactions and disordered many body eigenstates can be localized resulting in a many body localized (MBL) phase, provided that interactions are sufficiently weak. The MBL phase and the MBL transition are unique for several reasons and challenge the basic foundations of quantum statistical physics. In the MBL phase the system explores only an exponentially small fraction of the configuration space and local observables do not thermalize leading to violation of eigenstate thermalisation hypothesis (ETH). In this talk I will describe unique properties of MBL phase, recent development in the field and in the end I will touch upon our recent work which demonstrates MBL to delocalisation transition in a quasi-periodic system. Date : 23.03.2017 (Thursday) Time : 3:30 p.m.
All interested persons are cordially invited to attend the lecture. Abstract: Quarks, the constituents of nucleons and many other particles, and gluons, the particles which mediate strong interactions, all carry a quantum number called color charge. However, the color charge has never been observed in isolation, and is always found `confined' into colorless states. No analytic description of color confinement exists, and finding one remains an unsolved problem. A model of quark confinement, suggested by Nambu, treats quarks as magnetic monopoles, which are the endpoints of Dirac strings. After an overview of all this, I will discuss a more physical version of Nambu's model, in which the strings are physical objects, and the magnetic charge is fully confined. The Department of Geography, Presidency University, cordially and warmly invites you to a series of lectures to be held from 5th - 7th April, 2017 at the A.J.C. Bose Auditorium. Abstract: In this presentation, She will start from text-book BEC and discuss how the experimental BEC differs from text-book problem from the angle of many-body physics. She will present qualitative pictures and essential features of the quantum many-body calculation developed by our group. From various application of this method in experimental BEC, She will demonstrate the efficacy of our technique. The importance of BEC in the present day research and its future in connection with quantum information will be presented. as a part of the celebration of the Bicentenary celebration of Presidency. All are requested to attend the seminar. Two talks for the Physics Weekly Colloquium. Abstract: Indirect detection is one of the most promising ways to search for dark matter in astrophysics. It involves searching for an excess of Standard Model particles on top of standard astrophysical backgrounds. Gamma-rays, X-rays, neutrinos, anti-protons, and positrons are typically used in indirect detection. In this talk, I will give a brief overview of the various techniques used in indirect detection of dark matter. I will discuss the latest status on various astrophysical anomalies and their interpretation in terms of a dark matter signal. Abstract: IceCube is a cubic-kilometer neutrino observatory buried deep in the ice sheet at the geographic South Pole. A total of 5160 Digital Optical Modules (DOMs) are deployed on 86 strings forming a three dimensional detector array. Over the past decade, South Pole has emerged as a leading site for neutrino astronomy, particle astrophysics and neutrino physics. IceCube's discovery of a diffuse flux of astrophysical neutrinos started a new era of neutrino astronomy. In this talk I will describe IceCube neutrino detector and will discuss some of IceCube’s results. Also, I will give an overview of plans to upgrade IceCube in the future. Professor Ohashi has been Professor of Social Development since 1993 and describs himself as an activist. He has been a regular visitor to South Asia since 1974 and implements the work of Shapla Neer (a Japanese NGO) in Bangladesh and Nepal. Prof. Ohashi also serves JANIC, the largest NGO network in Japan focusing ODA advocacy and the Nuclear Disaster in Fukushima. Abstract: Particle clustering is important in many natural physical and biological phenomena. it is important to understand processes that cause clustering in different physical contexts. Often, large-scale clustering is driven by interactions with an external medium which itself has correlations in space and time. An important physical effect in such systems is the back influence of the particles on the medium. This interaction can aid clustering, or destroy it. If a cluster does form, it may be compact and robust, or a dynamic object that undergoes constant reorganization. In this talk I will discuss how different types of ordered phases can be obtained as the interaction between the particles and environment is varied. Within a simple lattice gas model we derive an interesting phase diagram and unmask novel nonequilibrium phases. Dr. Chakrabarti is a graduate of 2007 from Presidency College, proceeding to post-graduate in the MSQE programme from ISI Kolkata and PhD from Boston University. The venue of this lecture series is Economics Seminar Hall. Prof. Banerjee specializes in Environmental Economics, Quantitative Development Economics, and Econometrics. She did her Ph.D. from University of Florida, Gainesville, USA in 1989, and Post-Doc from University of California, Santa Barbara, USA in 2001-02. Lectures will be held in Economics Seminar Room. Title : Are the intergalactic magnetic fields (IGMF) primordial? Abstract: Magnetic fields have been widely observed in the universe. From planets and stars, all the way to galaxy clusters magnetic fields of considerable strength and size have been repeatedly observed. Recent observational evidence also suggests that even the intergalactic medium in voids could host a weak magnetic field. Despite of their widespread presence, however, the origin of cosmic magnetic fields is still a mystery. In this talk we would like to address the question whether such fields are of cosmological origin? The idea of primordial magnetogenesis is attractive because it makes the large scale magnetic fields easier to explain. Nevertheless, this idea is not problem free, with a number of issues remaining open and matter of debate. We will elaborate on the aspects of primordial magnetogenesis and discuss the advantages and shortcomings of this proposal. Majorana fermions have been the subject of active interests in the recent years. Various theoretical measures have been proposed to probe the Majorana bound state in condensed matter systems particularly using superconducting platforms. The use of Josephson junctions as probes to detect these modes are considered to be fairly robust. In this talk, I will discuss dynamics in a resitively and capactively shunted Josephson junctions (RCSJs) hosting sub-gap Majorana bound state and show that analysis of the current-voltage characteristics reveals robust phase-sensitive signatures for existence of Majorana modes in such junctions. Dr. Dasgupta’s research focus is on environmental management in developing countries. She has done extensive analysis on health hazards of pollution, poverty/environment nexus, setting priorities in pollution control, deforestation, biodiversity loss, impacts of climate change on coastal zones and climate extremes, adaptation to climate change, cost effective regulations, monitoring and enforcement of regulations. She has conducted research activities in Bangladesh, Brazil, Cambodia, China, Colombia, Cuba, India, Iran, Lao PDR, Madagascar, Mexico, Tunisia, Vietnam and Yemen, and has published numerous articles on issues related to development and environment. Before joining the Bank in 1992, she taught at the American University and the State University of New York at Albany. She is a graduate at Presidency College and did her Ph.D. from the State University of New York at Albany. Please see the attached documents for further details and join us in the lecture. Title: Black Holes in the lab : Hawking radiation, superradiance and inertial frame dragging'. Abstract : I shall begin with a quick survey of special and general relativity, and then start with black holes. I shall focus on three interesting physical processes involving matter fields and particles in such spacetimes, namely, Hawking radiation, energy extraction from a rotating black hole (superradiance), and the dragging of inertial frames in rotating black holes. These phenomena are all well predicted from general relativity, but are difficult to observe in practice for physical black hole spacetimes. Next I switch to certain properties of acoustic perturbations in fluid dynamics, whereby, one may have `laboratory' analogues of black holes using certain specific kinds of quantum fluids. This amazing appearance of an `acoustic' curved spacetime within perfectly non-relativistic standard fluid dynamics leads to prospects of controlled experiments involving such analogue black holes whereby the three phenomena mentioned above may actually be observed. This is intradisciplinary physics bringing together ideas from fluid mechanics, general relativity, superfluidity and the physics of cold atoms.
" Games with Karma: Indian Board Games as a Commentary on Life "
Specialization : Digital Humanities, Game studies, video game and storytelling. 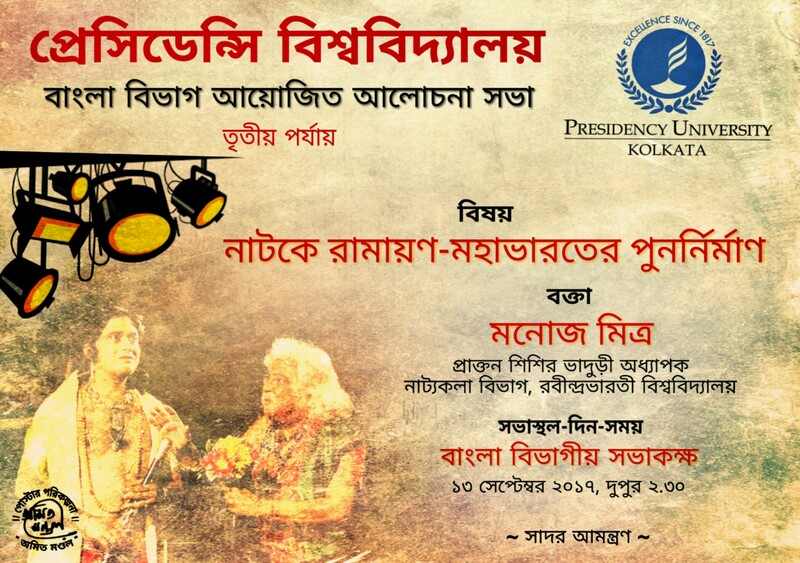 Cordially invites you to the Nirmal Kanti Majumdar Endowment Lecture Programme. Time : 11:00 a.m.– 4:00 p.m. The NKM Endowment Lecture will be held as per the programme given overleaf. Looking forward to your presence. A talk will be delivered by Dr. Joe Devine, Head, Department of Social and Policy Sciences, University of Bath, UK. Venue: Seminar Room, Sociology Department. Topic: “Social, Political and Anthropological aspects of development”. 3. Some structural properties of linear groups. Rigidity and arithmeticity. by highlighting some striking results. Abstract: interferometers are non-invasive optical devices used extensively both in research and industry. Both broadband (White light) and narrowband (laser) sources are used depending on the applications. A snapshot of important aspects of some applications will be presented. Scanning White Light Interferometer (SWLI) imager are ideal or microscopic imaging and surface topography applications such as surface profiling, Thin Film characterisation, 3D topography (Optical Coherence Topography). Common Path Interferometers (Sagnac) using imaging mirrors provide vibration free compact spectrometers for space applications. SWLI can easily be modified into PUPS (Pupil Plane SWLI) for multi-angle-multi-wavelength Ellipsometry. VISAR (Velocity Interferometer System for Any reflector) is an important plasma diagnostics for recording interference fringes from a moving illuminated object under wide angle light scattering. LIGO (laser Interferometer for Gravitational Observatory), a combination of Michelson interferometer and Fabry-Perot Interferometer for detection of gravitational wave, requires minimisation of noises such as shot noise, which is controlled (reduced) by injecting ‘squeezed’ (in phase uncertainty) light using non-linear optics (second harmonic generation followed by frequency down conversion in optical parametric generation) in the passive port (detection port) of the Michelson Interferometer. Another interesting feature is the generation of ‘squeezed’ state by radiation pressure back action. This can be a very useful study at University level with a lot of scope for learning., Sincere thanks. Here is another lecture program at Physics Department to be held on the 29th December, 2016. The abstract is given below. Kindly upload this to the departmental events. IceCube is the largest present neutrino detector at about 1 km^3 in instrumented volume. Built at the south pole, and deep into the Antarctic ice-bed, it is designed to detect ultra-high energy neutrinos incident at the earth with energies of 1 TeV and above. Since being built in 2010, IC has had remarkable success, detecting more than a 5 sigma evidence of a neutrino flux over and above known sources of neutrinos, such as those from cosmic ray interactions with atmospheric nuclei. In this talk, I will briefly describe the IceCube detector, its goals and results, and the standard interpretations of said results. I will then discuss how this neutrino detector can be used to detect an altogether different kind of particle, namely fast moving or "boosted" dark matter, showing in the process, that present observations at IC are really also compatible with this alternative scenario, for reasonable values of parameters in the theory. Abstract: Dark energy is one of the most tantalizing mysteries in current cosmological research. A host of observations confirm that about two-thirds of the energy content of the universe comprises of this negative-pressure ``dark energy'' component that causes the expansion of the universe to accelerate. In this talk, we will explore two distinct facets of dark energy research-- the theoretical and the observational. Many different theoretical models have been suggested for dark energy. We shall examine these theoretical models, and the constraints on them in light of current observations. A second approach to the dark energy problem is to study the various observations available to us with different statistical tools, and optimize these methods for obtaining maximum information on the dark energy parameters. Using these two complementary approaches in conjunction, we expect to shed light on the nature of dark energy. Abstract: Understanding fluctuations is fundamental to the formulation of statistical mechanics, where additivity plays a crucial role. For example, consider equilibrium thermodynamics which is based on the principle of additivity: Macroscopic state of a system can be determined by extremizing a thermodynamic potential (such as entropy or free energy). In equilibrium, additivity leads to the concept of intensive thermodynamic variable (temperature, pressure or chemical potential), which helps in understanding fluctuations in the system. However, in nonequilibrium, there is no unified principle to characterize fluctuations. In this talk, I aim to provide a statistical mechanics framework to characterize steady-state mass fluctuations in a broad class of nonequilibrium mass transport processes. from 20 to 26 October 2016.
on and from 20th to 22nd October, 2016 at 01:00 pm. 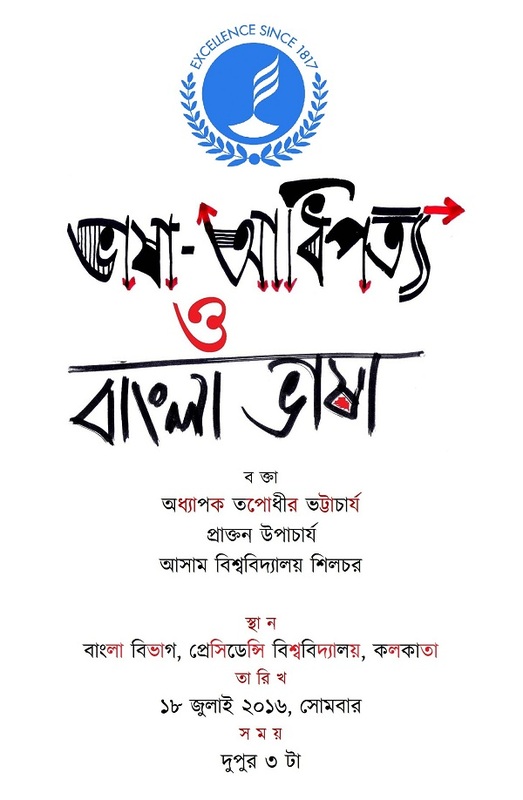 with the collaboration Bangiya Sahitya Parisad, Kolkata. & Seminar Hall, Bangiya Sahitya Parisad, Kolkata (22/10/2016).
" Jewish Contributions to Hindi Literature and their Portrayal in it "
Abstract: In emerging markets, policy and politics are central in shaping credit supply and its effect on firm growth. We show how using evidence from India. Reforms in creditor rights shape the type of credit in an economy and in particular, enhance the supply of arm’s length credit relative to relationship banking. Policies attempting to direct credit towards small firms can have the counterintuitive effect of inhibiting small firm growth. Directed lending policies can shape the flow of credit in directions sought by the state but state ownership of lenders introduces a political channel that can additionally modulate these flows with unclear effects on output. Abstract: An outstanding challenge for theoretical physics today is to construct an effective framework for quantum systems including nonperturbative effects. We need to understand how to include both weakly coupled partons and strongly coupled IR degrees of freedom together into a complete and consistent framework. This is relevant for QCD as lack of suitable factorization of hadronic amplitudes when momentum transfer is above the saturation scale, formation of QGP in heavy-ion collisions, collective flow in collisions of small systems and many other such experimentally accessible phenomena require us to construct such a framework for understanding them. We will propose a new framework for QCD in this direction and discuss concrete progress made towards its construction. We will argue that the best context to first employ this framework will be to heavy-ion collision experiments. Finally, we will discuss a toy model where the full proposed framework can be explicitly constructed. Title: What do you do with your Science Degree?
" Criticism in the New Century: Ismat Chughtai's "Lihaaf" and its Discontents"
Abstract: When a quantum system is driven periodically in time by varying a parameter (interaction/externally applied field) in time, quantum interference can result in surprising counterintuitive phenomena even in very simple systems. In many-body context, periodic drive can give rise to non-trivial periodic states which can be understood by extending the fundamental framework of equilibrium statistical mechanics. In this talk we will give an introduction to some of these interesting recent developments. Department of Mathematics, Presidency University is organising an outreach programme for 10+2 students on 12th September, 2016. The interested students are requested to send an email to < math.presidency@gmail.com > for registration with their name, class and the name of their school. There are limited seats, so early registration is encouraged. The email registration will be closed on 9th September, 2016 and the selected candidates will be intimated by an email on 10th September, 2016. There will be a registration fee of Rs. 50/- (rupees fifty only) payable at the event. Abstract: In this series of lectures, a purely probabilistic proof of Weierstrass approximation theorem will be presented. Basic probability theory needed for the proof will be developed in a self-contained manner. The statement and motivation of the approximation theorem will also be discussed from the viewpoint of real analysis. These lectures will explain, among other things, how inter-dependent the two subjects (probability theory and real analysis) are. Special care will be taken so that this series is accessible to the students. Dr. Ranjit De, Advanced Photonics Research Institute (APRI) and Department of Chemistry, Gwangju Institute of Science and Technology (GIST), Gwangju 500-712, Republic of Korea. Abstract: The first observing run of LIGO’s second-generation detectors gave birth to the new field of gravitational wave astronomy. This run achieved the first direct detection of gravitational waves, the first observation of black hole binaries, the first look at black-hole dynamics and tests of General Relativity in extreme spacetime conditions. Achieving these discoveries required detectors at the frontier of measurement science. Fully exploiting the promise of this new field will require building out the international network of terrestrial gravitational-wave detectors, continually upgrading the detectors in the network’s existing facilities and developing new facilities to expand further the reach of these detectors. This represents significant opportunities for detector development in India. All are welcome. Abstract: Spin liquids are intriguing magnetic states of matter that are neither ordered (like ferromagnets or antiferromagnets) nor disordered (like paramagnets), and require new concepts for their description. A complete understanding of such states is still lacking and many fundamental questions remain. In this talk, I will describe a simple class of spin liquids and show why such states are non-trivial and how their properties can be understood most simply in terms of emergent gauge fields that are not present at the microscopic level. Abstract - There are many systems and phenomena in nature and everyday life, which we encounter frequently and yet understand poorly. In this talk, I will present a tiny subset of such phenomena and explore whether an interdisciplinary set of techniques from mathematics, statistics, computation and statistical physics of networks can shed fresh insight. Diverse examples such as detecting vulnerabilities in infrastructure networks, the design of image processing devices, non-invasive diagnostics, synthetic biology inspired protein design etc. would be furnished. All of these would be firmly grounded upon experimental data. Finally, I would demonstrate how an iterative cycle of experiment-driven modeling and model-driven experimentation can uncover new and exciting findings in biology. The Department of History takes pleasure in inviting you to Roy Bar Sadeh's lecture titled "Producing a New Network of Belonging in the Indian Subcontinent: al-Manar's Milieu and Bombay's Arab Mercantile Community (1898-1935)." The talk will take place on Wednesday, 17th August, beginning at 12:30 pm, at the History Lecture Theatre (Room 2). Mr. Roy Bar Sadeh is a PhD candidate in History at Columbia University, New York. He works on transnational intellectual interactions between Muslim scholars in the Mashriq, South Asia and Central Asia from the mid-19 century to the 1940s. The Paschimbanga Itihas Samsad and the Department of History, Presidency University, take great pleasure in inviting you to the XXIII Professor Susovan Chandra Sarkar Memorial Lecture. This year, Professor Sugata Bose, Gardiner Professor of Oceanic History and Affairs at Harvard University, will be speaking on the subject of 'Sahitye Itihas, Itihase Raj-niti: Nawabi Theke Swadeshi Bangla (History in Literature, Politics in History: From Nawabi to Swadeshi Bengal)'. The lecture will begin at 4:00 pm on Tuesday, 16 August 2016, at the Political Science Lecture Theatre, Presidency University, Kolkata. Dr. Debjani Bhattacharyya, is Assistant Professor in Department of History, Drexel University, Philadelphia, USA. She has done her Masters from Jadavpur University, Kolkata and PhD from Emory University, USA. Her research interests and publications are in the field of urban environmental history, legal history, history of economic thought and postcolonial studies. After a series of requests in 1770, Benjamin Lacam received a land grant to build his New Harbor close to Channel Creek east of Sagar Islands in the Bay of Bengal. Lacam claimed that he had discovered a "natural harbour" in this tidal delta, where the depth of water and the landmass remained constant affording a safe passage from the Bay to the docks of Calcutta. Yet, two months before his Harbor was to begin functioning in 1776 the Calcutta Revenue Committee withdrew the grant from Lacam halting construction. The reasons for canceling the grant were twofold: The first stemmed out of the presence of water in the land that was granted to him, as water within a land grant “went beyond the spirit of the document,” as one Company official claimed. Second, the depth of the Harbor failed to yield a constant measurement as Lacam initially claimed, posing a problem of geographical evidence within dispute arbitration. What followed was a legal case lasting a quarter century that begun in the Mayor’s Court in Calcutta in 1776 and ended in London 1803. The legal debate that ensued proceeded primarily along three lines, a: distinguishing land and water as separate jurisdictional entities within law, b: the accuracy of instruments to measure depth of water and finally c: human integrity in the person of Lacam. Some of the members of the jury and surveyors who were called upon to judge and testify understood the seasonal variability and variety of land-water admixture that made up the tidal landscape. However, they all agreed that this mobility was a "problem" that needed to be fixed through accurate instruments of measure and new legal imaginaries in the name of safeguarding company’s interests in the emerging property and land market. This failed infrastructural venture brings to light the imbrications of property, environment and law for Lacam speculated not just financially, but also with geography and law. The talk shall focus on the rich physics associated with mechanical energy transport through artificially constructed granular systems such as the Newton’s cradle, and decorated 2D and 3D granular structures with closed or random packing. Mechanical energy travels as a solitary wave in 1D granular systems. Such a system turns out to be non-integrable, thereby leading the solitary waves to break down and form again during collisions, thus giving rise to large energy fluctuations (rogue fluctuations as in rogue waves) and very slow relaxation in the non-dissipative limit, a topic of interest in non-equilibrium statistical physics. We will touch upon impact decimation in decorated 1D, 2D and 3D granular systems, which is becoming a mature topic now and turns out to be of interest to the blast mitigation community. We will close with some comments on crater formation during impact onto a 3D bed. 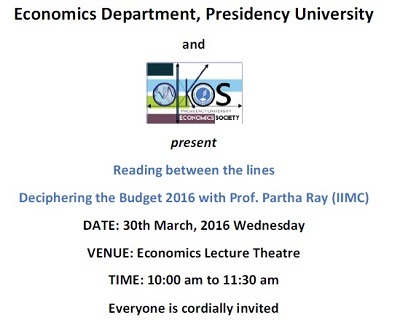 20 July 2016 at Economics Lecture Theatre, Presidency University. Despite similar levels of ethnic diversity, some places manage to remain peaceful while others experience ethnic conflict. Using a game theoretic framework, I argue that this variation is related to the structure of ethnic engagement in the society. Ethnic engagement refers to a business relationship between two individuals which can be inter (with an individual of opposite ethnicity) or intra (with an individual of same ethnicity). I show, the more segregated an economy is i.e., the higher is the degree of intra-relative to inter-ethnic engagements, the more conflict prone the economy is. The chances of conflict are lowered if there are “inter” ethnic ties in form of social engagement, i.e. if individuals derive utility from social interactions. Absolute poverty can also play a role in precipitating conflict. I also provide an empirical analysis in the context of Hindu-Muslim violence in India. The analysis shows that higher is the inbreeding homophily at a place the greater is the probability of occurrence of a conflict there, which validates the main result of the paper. Annual Kuruvila Zachariah Memorial Lecture. The Department's Lecture Theatre no. 2. Abstract: This paper will begin with the dilemma of the professional historian in contemporary India. It has on the one hand led to a new kind of accountability of the professional historian to a very sceptical public, well beyond the confines of colleges and departments and journals. It has also led to a relative "irrelevance" of professional history at a time of burgeoning of popular and public histories which show no particular commitment to positivist evidentiary protocols. Can we think of a historical method appropriate to our times? To what extent should such a method be attentive to the sense of the past rather than the meanings of the past which appear to set academic histories apart from the copious productions of the popular/sectarian/interested historians? Finally, what are the possible ways in which the professional historian's recast methods recover their claims to a credible account of the past? The paper will attempt to answer some of these questions through reference to the afterlives of Tipu Sultan in Kannada lavanies. Professor Janaki Nair teaches History at the Centre for Historical Studies, JNU. Her research interests, which have largely focussed on the region of Mysore/Karnataka, range from labour and working class history to legal history, and from histories of the city to histories and theories of feminism in India. Her published works include Mysore Modern: Rethinking the Region under Princely Rule (Orient Blackswan, 2012) and The Promise of the Metropolis: Bangalore's Twentieth Cenutry (OUP, 2005, 2006). Prof. Rana Adhikari from California Institute of Technology (LIGO Team) will be giving the colloquium on Wednesday 20th April at 3.30 PM at AJC Bose Auditorium. Time: 3.30 PM @ AJC Bose Auditorium. In 1916, Albert Einstein predicted the existence of gravitational waves—vibrations of spacetime produced by the most cataclysmic events in the universe that travel at the speed of light. Yet for several decades, it was believed that these waves either did not exist or were too weak to detect. Over the past 45 years, scientists have been developing ever-more-sensitive detectors capable of measuring these spacetime distortions from as far away as hundreds of millions of light years. On September 14th, the universe spoke to us for the first time through the spacetime vibrations of a pair of massive black holes from a billion years ago. In this talk, Adhikari will describe how our understanding of the quantum physics of the very, very small has allowed us to explore gravitational physics of the very, very large. The window onto the dark side of the universe is now open. In Physics Tea we will have a discussion session with the speaker. Abstract: Starting from the distant nebula to our very close candle flame, Plasma is all around us. Plasma Physics is a very old division and it has a wide range of application in space and astrophysics, controlled Fusion Reaction (Tokamak), accelerator physics etc. It also has a variety of commercial and industrial applications. So, it's very important to understand some basic plasma phenomena and its physical mechanism to understand those applications and explore new areas of applications. But, because of the presence of a large number of charged particles and non-linear interactions between them, Plasma is indeed a very complex system to deal with. The properties of plasma are diagonised by using a probe, e.g Langmuir probe. We have studied some interesting properties of plasma by analysing the plasma parameters under the influence of applied electric and magnetic field. The talk will cover these and finally we will discuss briefly on plasma confinement using magnetic field and its use in Tokamak. It will be a short journey to the Fourth State of Matter, the Plasma world. The popular notion of 'esoteric', extant in only the cosmic or subatomic scale, is debunked with examples of everyday phenomena that are as mysterious. Some of these can be observed in table-top experiments and back-of-the-envelop calculations. In almost all these cases, the mystery is in the fact that the individual particles or atoms do not respond to a probe, a collective organization of the system 'sees' and 'responds' where there should seemingly be no response at all. These are 'emergent' properties of the 'many', not amenable to the reductionist approach prevalent in the last century. In much of these, quantum organization plays a central role. Abstract: We will start with the deduction of Euler-Lagrange equation from Hamilton's principle of least action and we will show the equivalence of Lagrange's equation and Hamilton's equation. Then we will discuss Liouville's theorem, Poincare's Recurrence theorem and it's applications. Abstract: Two dimensional nano materials are the promising choose as a electrode material for supercapacitor application due to their large specific surface area, extra electrochemical active sites, high mechanical flexibility. Free standing hybrid films of functionalized MWCNT (–COOH group) and α-Vanadyl phosphates (VOPO4.2H2O) are prepared by vacuum filtering. The surface morphology and microstructure of the samples are studied by transmission electron microscope, field emission scanning electron microscope, Raman spectroscopy and XRD. Electrochemical properties of hybrid films have been investigated systematically in 1M Na2SO4 aqueous electrolyte. The hybrid material exhibits a high specific capacitance 236 F/g with high energy density of 65.6 Wh/Kg and a power density of 1476 W/Kg. Abstract: CuO Quantum dots (QDs) of size 4.5 nm decorated on rGO sheet to form nanocomposites with different weight percentages synthesized via simple soft chemical route. Tuning of CuO QDs absorption towards visible region from UV region in presence of rGO was also observed. The luminescence of rGO was found to be quenched in rGO-CuO nanocomposites owing to charge transfer from LUMO of rGO layer to the conduction band of CuO. Systematic and concise studies of photocatalytic performance towards degradation of methylene blue dye by CuO QDs along with rGO-CuO nanocomposites were presented in this work. Nanocomposite with equal weight percentage of rGO and CuO degrades almost 99 % of methylene blue under irradiation of visible light for 50 minutes shows maximum degradation efficiency. In the earlier part of the development of quantum mechanics, entanglement in QM was used to show some apparently unacceptable counterintuitive features of the interpretation of QM. But starting from the last part of 20th Century, physicists started showing some nice applications of entangled state in some information processing phenomena like super dense coding, secret key generation, quantum computation and quantum communication. We shall discuss some of the basics of quantum information to understand how entanglement is indeed a resource for information processing. Abstract: Unveiling the fundamental laws of physics at the smallest attainable distance scales requires a herculean effort on both the experimental and theoretical fronts. An outline of such efforts will be given in this colloquium. After a review of the circumstances leading to the discovery of the Higgs boson, a glimpse of some yet unanswered questions will be given. "Transgender Embodiments and Experiences: Problems and Possibilities"
Popular Mathematics Lecture organized by the Department of Mathematics, Presidency University. Speaker: Professor Arnaud Chéritat, CNRS, FRANCE. Date & Time: 22nd March 2016, Tuesday at 4 pm. Venue: Mathematics Lecture Theatre, Presidency University. Abstract: Smale proved in 1959 that one can turn the sphere inside out in the Euclidean 3-space, by going through immersions. However, he did not give an explicit description of how to realize it. Since then, many people gave different ways to do it. I will briefly present the history of explicit sphere eversions, then describe a new way to do it. An international seminar series organized by the Department of Mathematics, Presidency University. Dates & Time: 21-22 March 2016 & 24-25 March 2016 at 11.30 am. Title of the seminar series: Parabolic Implosions in Complex Dynamics. Abstract: I will explain the local dynamics of parabolic fixed points and their perturbation in one dimensional complex dynamics. The first part of this series will include the Leau flower theorem, the Fatou coordinates, horn maps (conjugacy invariants) and their covering properties. The second part will deal with vector field comparison, implosion, geometric limits, renormalization, near-parabolic renormalization. Abstract: Diophantine Approximation is regarded as the analysis of 'how the set of rational numbers is included inside the set of real numbers'. That is, we try to understand how "well" a generic real number can be approximated by rational numbers. The starting point of this discussion will be a classical result, namely the "Dirichlet's Theorem". We will then talk about the "Very Well Approximable Numbers" and "Badly Approximable Numbers" followed by the celebrated result of K. F. Roth on the strength of which he was awarded the Fields medal. We shall also see the higher dimensional natural analogs. We also review these classical results from the point of view of homogeneous dynamics. We shall see how the diophantine properties of a number or vector corresponds to the properties of certain orbits in some homogeneous dynamical systems. Finally, if time permits, we shall discuss a landmark work by Kleinbock D. Y and Margulis G. A on "Metric Diophantine Approximation on Manifolds". in the canteen (Nine to Nine). This event is part of a series of conversations--Café Presidencian--with eminent scholars the Honourable Vice Chancellor has inaugurated as part of the university's lead up to its bicentennial commemoration. One day workshop on "Philosophy of Mind"
Time: 10:30 a.m. to 4:30 p.m.
'The World and Words of Munshi Meherullah, and Muslim-Christian Polemics in Bengal, 1885-1907'. Muslim atrap communities in the eastern part of the Bengal Presidency (present day Bangladesh), were the target demographic of Christian conversion efforts in the last decades of the nineteenth century. This gave rise to Bengali Muslim apologetic movements, whose main actors and their audiences were representative of networks of medium and low thought. Debates (bahas) between Muslim preachers and Christian missionaries, as well as religious meetings (waz mahfils), characterized these apologetics. Disseminated through street-market chapbooks in Musalmani-Bengali or dobashi Bengali, such polemics translated the cultural valences of Christianity and Islam both as personal faith and as communitarian identifying markers. In this paper, I analyze a selection of such pamphlets authored by an itinerant tailor called Munshi Meherullah, who spearheaded the atrap Bengali reaction against missionary efforts. on the subject of "Climate Change and the Humanities". The talk will be held on 10 March 2016, starting at 4:00 pm, in the AJC Bose Auditorium. "e-Resources@Presidency: Developing better research environment"
on 8th March, 2016 at AJC Bose Auditorium from 1.30 PM -5.30PM. Abstract: The aim of this talk is to prove Euler's formula and classify all regular polyhedrons. Moreover the Groups of symmetries of a regular polyhedron and its dual are discussed. 'Socialism and Religion in Nineteenth-Century France'. From a Marxist perspective, the history of socialism is marked by a materialist, secular struggle against religious superstition. Due to the dominance of Marxist narratives in the historiography of socialism, it is often overlooked that the early socialist currents in France articulated decidedly religious identities and fundamentally based their social theories on new concepts of “religion.” These socialist schools, especially the Saint-Simonians, Fourierists and Icarian Communists emerged since the 1820s and were active under the July Monarchy between 1830 and 1848. Due to the failure of the Second Republic and the succeeding rise of Proudhonism and Blanquism, their religious doctrines were largely eclipsed. Consequently, scholarship has barely payed any attention to the continuing role of early socialist ideas for the formation of new religious movements since the 1850s, especially Spiritualism and Occultism. The paper will firstly discuss the role of “religion” in early French socialism and then argue for the lasting influence that socialist concepts exerted on the European history of religions. Abstract: The aim of this talk is to present proofs of four classical inequalities [AM-GM, Cauchy-Schwarz, Holder and Minkowski] using the theory of convex functions. 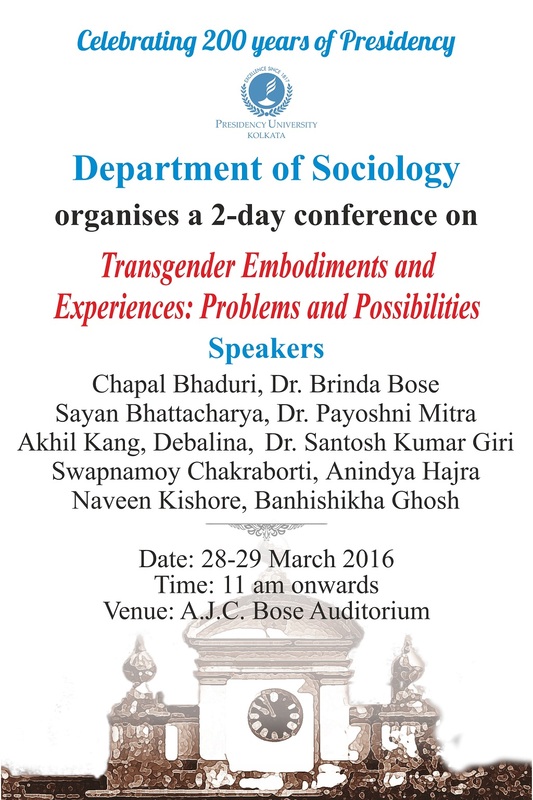 a one day symposium at PU (AJC Bose Auditorium) on 23rd February, 2016. "Questions of Caste and Identity: Religion, Gender, Power". The event will be held in the Bankim Sabhagriha on Wednesday, 10 February 2016, beginning at 1 pm. Abstract: This theorem states that if there are injective maps f: A -> B and g: B -> A between two given sets A and B then there exists a bijection h: A -> B, between these two sets A & B. Various proofs of this theorem will be discussed in this talk. on 1st and 2nd February 2016. Registration for the workshop will be closed by 27th January 2016. Department of Physics, Presidency University. Date: 29th January, 2016 (Friday). 20th January 2016, 1:00 P.M.
20th January 2016, 10:30 A.M.
during 4th January - 9th January, 2016. This programme is funded by the National Centre for Mathematics and aimed mainly at college teachers. 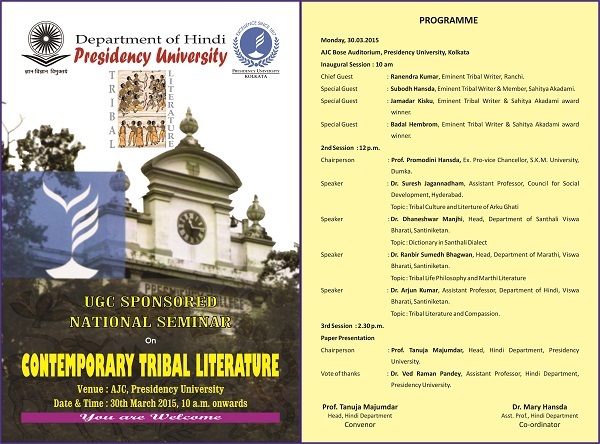 The venue of this programme has been shifted from AJC Bose Auditorium/MLT to room number 8 in the main building. Presidency University presents a three day Workshop on Entrepreneurship Development organized by Department of Economics and Presidency University Young Entrepreneur Society (PUYES). The workshop will start with an orientation programme Being – becoming: 10 Steps to Entrepreneurship on 6th January 2016. On 7th the Keynote Address will be given by Mr. Chandra Shekhar Ghosh, CEO, Bandhan Bank. That will be followed by Technical Sessions and a round table, Meet the Entrepreneurs. Director, KPMG, will launch an e-market site for the students of Presidency University. As an extension of this programme a Panel Discussion on Entrepreneurship - the preferred professional choice will take place in Bengal Global Business Summit 2016 on 9th January 2016. Department of History, Jadavpur University, Kolkata. As Eric Hobsbawm once wrote, before 1848 or when he suggests the “Age of Capital” begins, parts of the world had either marginal or superficial contacts. Hobsbawm had argued that the tightening net of the international economy drew even the very remote geographical areas into direct contact with the rest of the world. Among other things this paper addresses the shifts in the political economy of capitalism since the 1870s to the present and related transformations, if any, in the world of culture, and the relationship of the global and the local in the making of the different cultural forms and artifacts. Although this paper is about post 1870 development of capitalism, I will also delve into the history of the new world, rather on the cultural exchanges between the old world and the new world, meaning between the Americas and the rest of the world. This is because colonial as well as global capital needs to be analysed through the lens of cultural consumption. I will specifically address consumption as it relates to food. Food as a commodity is crucial in understanding the development of capitalist modernity. How capitalism shapes and defines the contours of a commodity can be understood in concrete terms through food. "Issues in Economic Theory and Policy"
The objective is to encourage young researchers, who are undertaking M. Phil / Doctoral research or have completed such research, to present their output before a broader audience and receive a critical feedback on their work by renowned economists. "Managing Intercultural Encounter in the Early Decades of Calcutta's History, 1690-1750". The lecture will take place in theBankim Sabhagriha on Wed, 7 October 2015, from 4:30 pm. The History Department in collaboration with Kashish Forward and Gaylaxy Magazine would like to invite you to a screening of LGBTQ films, followed by a discussion on 29 Sept 2015, 3:00 pm to 6:30 pm, in the AJC Bose auditorium. 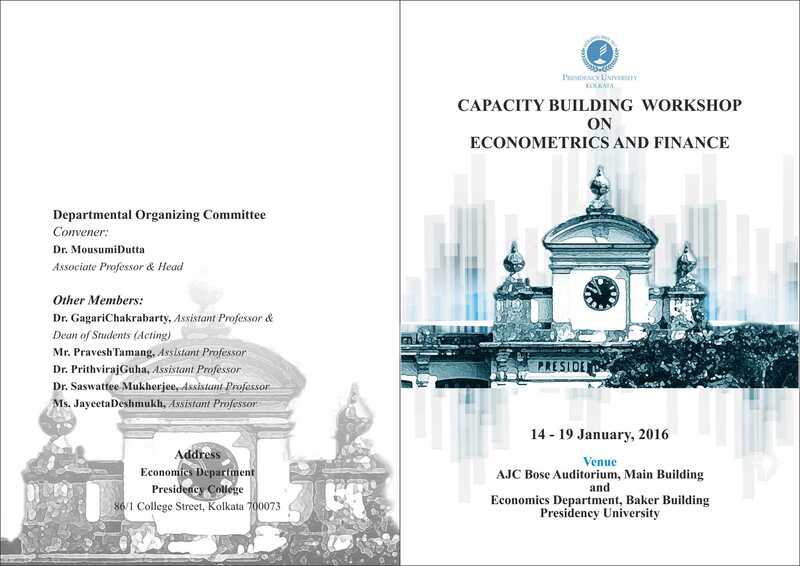 Department of Economics, Presidency University, Kolkata is organizing a Capacity Building Workshop on Econometrics and Finance from 8th to 14th of October, 2015. The purpose of the Workshop is to promote the level of understanding of applications of econometric theory and techniques on financial data analysis, as well as enhancing the research capability of participants. The concept note along with tentative Programme is attached. Due to limited facility in the department, only fifteen Faculty Members and/or Researchers will be able accommodated . Participants are requested to bring their own laptops. Interested persons are requested to kindly email their intention to participate to the undersigned in the mail id mousumi.econ@presiuniv.ac.in They should also intimate whether they are currently using any of these methods, or propose to do so in the future. A registration fee of Rs. 2000 will be charged from the applicant. Eminent mathematician John F. Nash passed away recently. He had received the Nobel Prize in Economics in 1994 for his seminal contribution to the economic application of game theory. will be speaking on the works of Nash and its applications in economics. Why Study History (of Science)? SPEAKER: Dr. Projit Bihari Mukharji is Martin Meyerson Assistant Professor in Interdisciplinary Studies, History & Sociology of Science/ South Asia Centre, University of Pennsylvania, Philadelphia. He has studied at Presidency College, Kolkata, Jawaharlal Nehru University, Delhi and School of Oriental and African Studies, London. He is a writer of Nationalizing the Body: The Market, Print and Daktari Medicine (London: Anthem Press, 2009) and has written extensively on a variety of fields such as history of medicine, science, sports and the revolt of 1857. ABSTRACT: Why study History or, History of Science for that matter? Is it not time we left the past and looked ahead to the future? In an age where we are possibly less than a generation away from actually setting up colonies on Mars what can History teach us and why should we care? Using examples from the latest research in genomics, I will argue that History in general and History of Science in particular is in fact more relevant now than ever before. Simultaneously, I will also make a second, but related, argument in favour of blurring the lines between History and History of Science by drawing upon the examples of gender and caste. .
Venue: A.J.C. Bose Auditorium, Presidency University, Kolkata (Ground Floor, Main Building). from 19th to 21st March 2015 for PG first year and second year students with basic knowledge of Time Series Econometrics. Everyday workshop will be from 10 am to 5 pm with one and half hour lunch break. 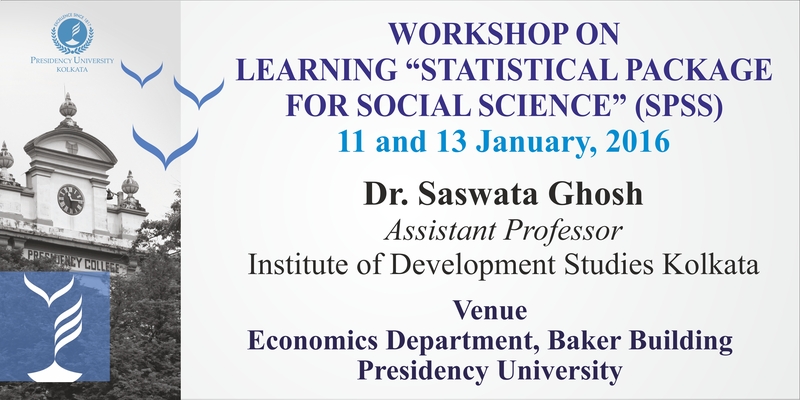 Professor Subrata Sarkar of Indira Gandhi Institute of Development Research, Mumbai will be the resource person. Prof. Sarkar is a Graduate of Presidency College (1980 batch). He was awarded his PhD by University of South California. Prof. Sarkar has been Visiting Faculty in South California and Sydney Universities, and a consultant of RAND Corporation. His specializes in Corporate Governance, Applied Corporate Finance Productivity and efficiency studies, and Risk Modelling. National seminar on ‘Dialect and identity crisis’. The Department of Biological Sciences, Presidency University cordially invites all to the National symposium on "Environmental Impact on Biodiversity and Plant Development"
The role of women in the Panchayati Raj. The lecture will be held on 22 January 2015 at 1:00 PM at the AJC Bose Auditorium, Main Building, Presidency University. You are invited to attend the lecture. Professor Ayesha Jalal, Mary Richardson Professor of History, Tufts University, USA. The lecture will be held on 22 January 2015 from 4 pm in the AJC Bose Auditorium. We would be grateful if you would also bring this lecture to the attention of your students. As part of the UK-India Research Initiative (a grant which Presidency was awarded in 2013-14 for collaborative research with the University of St. Andrews, Scotland), we are organising a conference to showcase our various projects under the theme 'Narratives of Migration'. The departments of History and English from the both the universities are involved in this inter-disciplinary venture. "Exchange Stories: A Creative Response"
All are welcome so please feel free to bring anyone who might be interested. Date: 13th January ,2015,9:30 A.M. Date: 13th January ,2015,3:30 P.M. Date: 13th January ,2015,2:30 P.M. Professor Gautam Bhadra will preside over the session. Date: 5th January ,2015,11:30 A.M. Please click here for detail programme. On the 22nd and the 23rd of December, 2014, the Department of Physics, Presidency University, is organizing a reunion in which all former students from way back 1960s to yesteryear’s fresh graduates are cordially invited. "China’s Indian Ocean Strategy and India’s Response"
Date: 19th December ,2014, 3:00 P.M.
Time: 3 P.M. to 4 P.M.
Sumit Sarkar, Tanika Sarkar and DipeshChakrabarty will be in conversation with Prof.Mridu Rai from 1:30 pm on the 15th of December, 2014, at the AJC Bose auditorium, Presidency University. The conversation will also be followed by a short introduction of his recent work "Modern Times: India," by Sumit Sarkar himself. Thereafter, the floor shall be open for an interactive session. All those who wish to attend the event must register themselves online as the entry would be limited. If one finds the registration procedure closed, online, he/she must come down early on the day. In case we have unoccupied seats unregistered attendants would be slotted in on a first come first serve basis. For those who miss out, we will try and come up with a video of the entire conversation at a later date. Venues: A.J.C Bose Auditorium and Bankim Sabhagriha. 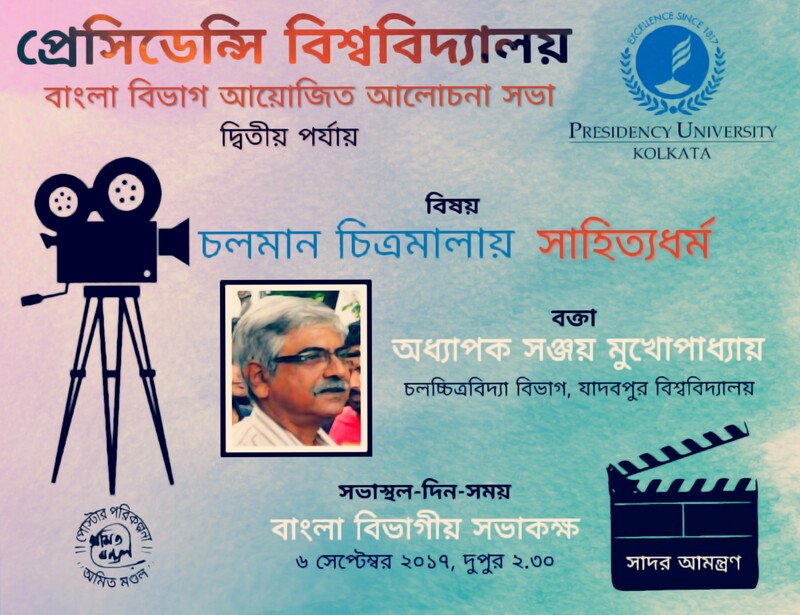 First Nirmal Kanti Majumdar Lecture Series on 17 November, 2014 at 1.30 p.m.
at the AJC Bose Auditorium of the University. The ‘Global Shakespeares’ conference at Presidency University, marking the Bard's 450th year of birth, invites papers and panels that examine any aspect of Shakespeare's plays and poems within this larger context of the global. Papers and panels might look at sixteenth-and-seventeenth century contexts, as well as any subsequent adaptations, appropriations, or productions. Professor Jyotsna Singh, Michigan State University, will deliver the keynote address. Professor Shormistha Panja, Delhi University, Professor Sukanta Chaudhuri, Professor Emeritus Jadavpur University and Professor Swapan Chakravorty, Jadavpur University, will be plenary speakers. Monday, 3rd November 2014, at 12.00 p.m.
H.E. Mr. Miloslav Stasek, Ambassador of the Czech Republic to India and delegates from Czech Universities will visit Vice-Chancellor, Prof. Anuradha Lohia. A roundtable conference on Experiences of Conflict, Gender and Transnational Justice: South Asia and Beyond, is to be held at the AJC Bose Auditorium. The website will be launched formally by the Hon'ble Vice-Chancellor of Presidency University, Prof Anuradha Lohia. The Honorary Consul of the Netherlands, Mr Namit Shah will also be present. Title: "The Uncertainty of Survival"
The Department of History, Presidency University launches the Presidency Historical Review, a students’ peer-reviewed academic journal. It addresses research interests in historical studies with an inter-disciplinary and inter-regional approach, while catering especially to the research interests of undergraduate, graduate and research scholars. Although the journal primarily focuses on South Asian studies, it also welcomes academic writings from other areas of research. It aims to be a forum of scholarly discussion, and encourages the work of new scholars. All abstracts and articles are independently and confidentially refereed by a students’ board, and a distinguished, multi-disciplinary Board of Editors. In publishing its first issue, the Presidency Historical Review is sending out a call for papers for the journal. All interested should send an abstract to presidencyhistoricalreview@gmail.com by 30th November, which should include the title, the theme, and original arguments, if any. The article should be in English, and must not exceed 3000 words (which is the maximum word limit). The journal shall also include a section on book reviews (for which the maximum word limit is 1000). Contributions to both are welcome. In terms of originality, the articles might be based either on fresh primary research, or new perspectives on work already done. Manuscripts should be submitted electronically in MS Word format and should conform to the Chicago Manual of Style (16thEdition). All copies, including captions, tables and references, must be typed double-spaced, in 12-point Times New Roman font, while footnotes should be in 10-point. All visuals (with captions) must appear at the end of the article. Manuscripts will be sent out anonymously for editorial evaluation. Obtaining permission for any quoted or reprinted material is the responsibility of the author. Submission of an article implies commitment to publish in the journal. Authors submitting manuscripts to the journal should not simultaneously submit them to another journal, nor should manuscripts have been published elsewhere in substantially similar form or with substantially similar content. Undergraduate and post-graduate students are especially encouraged to contribute. For further queries please write to us at the aforementioned email address. Venue: A. J. C. Bose Auditorium. (on Tuesday, 28 October 2014 at 3:00pm in the AJC Bose auditorium). Title of talk: Citizenship, Belonging, and Subversion: The Invention of Tradition in Culinary Fictions of Asian-North America. Theme of his talk: Life Style Related Cancer Diseases & their Prevention. Persistence of useful memory: what do you see and what can you remember? ABSTRACT: The paper explores the myth of ‘Bengali exceptionalism’ that caste discrimination does, or did, not characterize Bengal unlike the rest of the Indian subcontinent. Born in a crucial historical moment, this myth has had varying degrees of empirically verifiable factual truth behind it. Its significance lay in the politics of its truth claims, not in its empirical sustainability. The paper begins with a few instances of blatant caste discrimination among all sections of the Bengali society. Examples are followed by an overview of the historiography of caste in Bengal since the nineteen forties. The meatier section of the presentation revisits a recent debate between a philosopher and a social scientist on the extent to which ‘subjective’ experience and ‘objective’ social science methods respectively could be engaged in successfully capturing the phenomenon of discrimination by caste. Finally, it considers how and to what extent such conversations have been and will be helpful in meeting the challenge of writing about caste in Bengal. ABOUT THE SPEAKER: Anirban Bandyopadhyay is a Junior Research Officer at the Educational Multimedia Research Centre, Kolkata. His doctoral research at Centre for Historical Studies, Jawaharlal Nehru University, New Delhi, focused on the self-fashioning of Mahisya caste in Bengal in the late 19th and early 20th century. He has published in EPW and South Asian History and Culture and in an edited Volume on Ambedkar’s politics and ideas published in 2014. His interest in the cultures of making and consuming ‘history’ as an idea in the public sphere, and in the practices of identity formation and affirmation in public spaces leads him to publish in newspapers, magazines and the social media.
" A Peasant Uprising in 19th Century Assam: Patharughat Movement and Its Consequences"
"The Relevance of Literature in 21st Century"
Topic: “Targeting ribosomal protein to impair cell division and mitochondria for the growth of Plasmodium." Topic: “METEORITES : THE POOR MAN'S SPACE PROBE". "The Problems of Translation of Classical Poetry : Kalidas’s Meghdoot"
"Big Data & Analytics – Scope & Impact"
Venue: A.J.C. Bose Auditorium,Main Building, Presidency University. Date and Time: TUESDAY, 16TH SEPTEMBER, 2014 , 3 P.M. TO 5 P.M. The speakers are Ms. Soma Banerjee and Mr. Mainak Sen, both directors of Data Brio Academy, collaborated with Wiley. 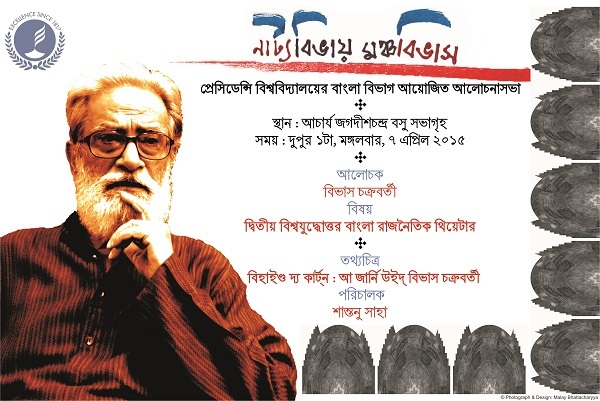 "The Modern Bengali Theatre Movement and Sambhu Mitra"
On 29 August 2014 (Friday) Professor Henry Schwarz of Georgetown University (Washington, DC) will deliver a lecture on Postcolonialism at the e-classroom in the Science Library building at 3 p.m.
on 28th August 2014 at 3pm at A.J.C Bose Auditorium, Presidency University. He is also an Emeritus Professor at Jawaharlal Nehru University. Abhi Bilkul Abhi, Zameen Pak Rahi Hai, Yahan Se Dekho, Akaal Mein Saaras, Baagh, Tolstoy aur Cycle are among his prominent works. He has also been awarded the Sahitya Akademi Award, the Kumaran Aashan and the Vyas Samman. Shri Kedarnath Singh will deliver a lecture on ‘Kavita Se Sarokar’ on this occasion. Honourable Vice-Chancellor will chair the programme. 26 August(Tuesday) 2014, 10:30 a.m.
on 25th August, 2014 at 3 pm at A.J.C. Bose Auditorium. Ms. Christine Marrewa Karwoski , Fulbright Hays scholarship fellow in India is invited as Speaker. She is doing research on Nath Sampraday in the department of Middle East South Asian and African Studies at Columbia University, New York, USA. The Hindi Department, Presidency University is going to organise a seminar on 22nd August, 2014 on ‘The Bazaar and the Bari: Calcutta, Marwaris and the world of Hindi letters’ at 3pm at A.J.C. Bose Auditorium. Dr. Rahul Parson the Resident Director of the Hindi Program of American institute of Indian studies (AIIS) Jaipur is invited as Speaker. Dr. Rahul Parson has done his Ph.D on Hindi novels written by Kolkata based Marwari on Kolkata from University of California , Berkeley (USA) under Prof. Vasudha Dalmia. The eminent Hindi novelist and Sahitya Academy Winner Alka Sarawagi is also invited as special guest on this ocassion. Her famous novels are Kalikatha Via Bypass, Shesh Kadambri, Koi Bat Nahi and EK Break Ke Bad. 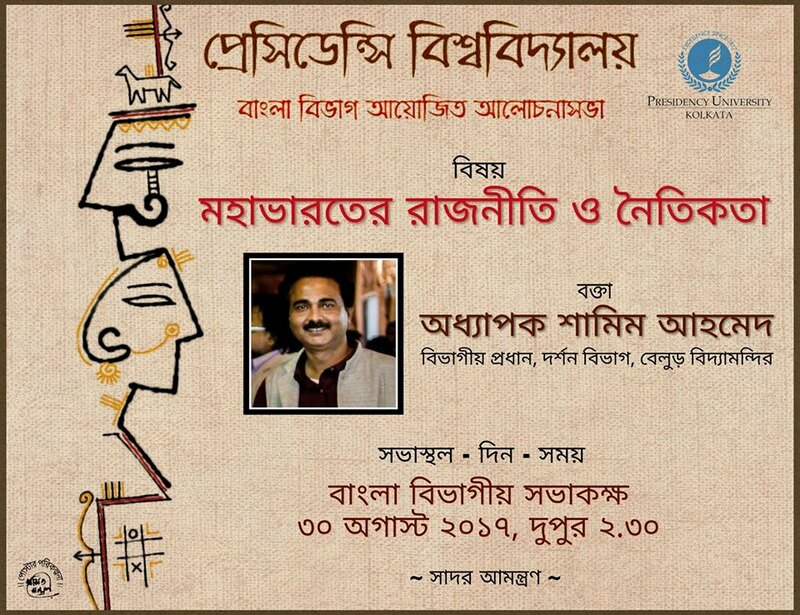 by Prof. Ramakrishna Bhattacharya in the AJC Bose Auditorium at 3 pm, today, 19 August 2014. "Modernism and the Banality of Narrative"
Date and Time: Thursday , 21 August 2014 , 3:30 p.m.
Venue: TCGC-ER will be held on Saturday, August 9th, 2014 at the A. J. C. Bose Auditorium, Presidency University. Registration: We may have a registration fee of Rs. 200 for faculty members and Rs. 100 for students, post-docs, and project scientists. In order for us to have an estimate of the number of attendees, please let us know if you plan to come, even if you won't be presenting. Abstract submission deadline Wednesday, July 30, 2014. Exact address and map can be found here. The AJC Bose auditorium is on the ground floor of the main building. The Topical Conference on Gravity and Cosmology - Eastern Region (TCGC-ER) is planned to be a biannual meeting in universities and institutes in and around Kolkata. The purpose of this conference series is to have regular scientific discussions on different aspects of Gravity and Cosmology with minimal administrative hassles. We plan to bring together experienced as well as young scientists of the Eastern Region of India who are interested in working actively on cosmology and gravitation. Tuesday 22nd July 2014 ,3:30 p.m. The concept note of the lectures, and readings will be available on the webpage of the department of Sociology, Presidency University shortly. The time and venue of the lectures will also be confirmed on the same page. The Department of Political Science will organize an International Seminar on "Peace Science, Conflict Management and Peace Economics: theme South Asia" on July 04, 2014 from 1 p.m. at the AJC Bose Auditorium of the University. Speakers from Binghamton University New York, University of Western Sydney, Asian Development Bank, ORF, CU and JU will address the seminar. The former President of India and eminent scientist, Professor A.P.J Abdul Kalam, will be visiting Presidency University on 18th March, 2013. Professor Kalam will be at Presidency to interact with our students and also to inaugurate the renovation of the historic Baker Laboratories building, which is celebrating its centenary this year. The University celebrated its 195th Founders’ Day on 20th January 2012 with customary enthusiasm. Poet Sankha Ghosh, an alumnus of Presidency College presided over the function and former Principal of Presidency College, Professor Amal Mukhopadhyay was the Chief Guest. Hon'ble Vice Chancellor, Professor Malabika Sarkar addressed a warm welcome to the guests in the Derozio Hall. The University Choir put up songs in keeping with the occasion. Professor Manu Auddy and Professor Nandalal Chakrabarti read out sections of Prasangiki followed by the Annual Prize Distribution ceremony where students were awarded certificates, medals and prizes for academic excellence and for co-curricular activities. The programme was conducted by Dr. Debashish Sen and Dr. Anik Chatterjee. The cultural programme organized by the University Choir was followed by the reunion organized by the Alumni association on the University lawns. On the 19th of January 2012, as a part of the Founders’ Day Celebration, a Past versus Present cricket match was played. On the 26th of January, 2012 the University observed Republic Day. The National flag was hoisted by the Hon'ble Vice-Chancellor and a programme was presented by the University Choir. A plaque in honour of Acharya Prafulla Chandra Ray was awarded to the University by the Royal Society of Chemistry (RSC), United Kingdom on the 31st of January, 2012. The Chief Executive of the RSC, Robert Parker unveiled the plaque. 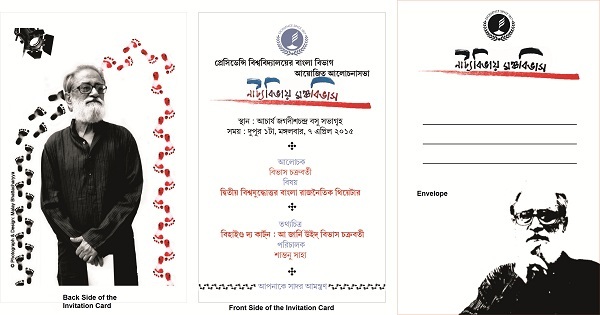 A national workshop under the aegis of Foundation for Academic Excellence and Access (FAEA) was organized from 6 to 15th October 2012 at AJC Bose Auditorium of the University. 34 FAEA Scholars from different parts of the country participated in this workshop. International conference on Digital Humanities in India held on 24 and 25 September, 2012. The speakers included Dr Mark Bernstein, Director, Eastgate Systems and Professor Barry Atkins, University of Wales, Newport. In September 2012 the first semester Postgraduate students of the University were welcomed by the Vice-Chancellor. The Dean of Students, Deboshruti Roychowdhury, the Heads of the Departments and other faculty members were present at the orientation. On 15th September, 2012 the Institute of Electrical and Electronics Engineers (IEEE) awarded the Milestones Plaque in the memory of Sir J.C. Bose. This award was given to the University, by the President Elect of the IEEE, Prof. Peter Staecker, at an event in September 2012, where the contribution and current relevance of Professor Bose’s work was discussed in a series of talks. On the 15th of August, 2012 the University celebrated the 65th year of the nation’s Independence. The Vice Chancellor hoisted the national flag and teachers, students and members of the nonteaching staff were present on the occasion. The University Choir put up a performance in keeping with the spirit of the occasion. On 9th July 2012 the First Semester of undergraduate classes of Presidency University for the academic session of 2012-2013 was formally inaugurated in the Derozio Hall. The Hon'ble Vice Chancellor; Professor Malabika Sarkar addressed the students Heads of all the Departments were present at the inauguration. The University Choir sang on this occasion. The Dean of Students, Deboshruti Roychowdhury coordinated the event and was present at the orientation. Students were taken to their departments by the respective Heads and introduced to the rest of the faculty. On March 24th, 2012, the Vice Chancellor of Oxford University, Professor Andrew Hamilton met Vice Chancellor Professor Malabika Sarkar and talked to students of Presidency University about studying in Oxford.